Story Shop showcases new writers by giving them a chance to read their stories as part of the book festival. When and where: The Spiegletent, Edinburgh International Book Festival. 15:00. It’s Halloween! (Almost.) I’m one of several writers who read or spoke about scary stuff on Dalry Road. My story, Scritch, scratch, the armoire, was based on a true story, as was Max Scratchmann’s tale of bad doctoring. We also had tales from our congenial host, stand-up comedy and more. 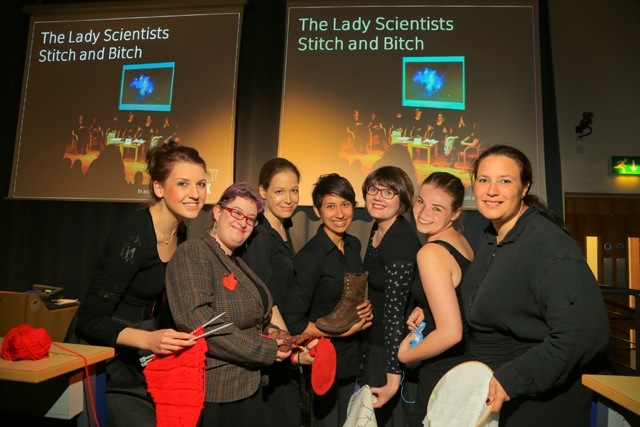 The lady scientists got back together and this time it was for a road trip to Dundee where we shared our stories as part of the Women in Science Festival. The D’Arcey Thompson lecture hall has great acoustics so we needed to help to raise our voices. The organisers of the festival had got the word out of our visit to all the right places so we had a great audience. It wouldn’t have been as fun without them, helping us along by laughing in the right places and generous with praise in the interval. When and where: D’Arcy Thomas Theatre, Dundee University, 28 March, 19:00 – 21:00. 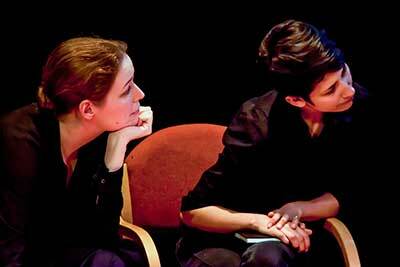 Liar’s League is a spoken word group where writers write, actors read and the audience listens. Each event has a theme, and this month’s was Here and Queer. I was delighted to have a story in the show. When and where: The Dairy Fringe Club, Hong Kong, 27 October, 20:00 – 23:00. To celebrate Ada Lovelace day, the lady scientists visited Edinburgh Observatory for a good natter. What a location! The room we were in were at the top of the building and all of Edinburgh lay stretched below us as we got ourselves organised. It was an intimate reading but a very enjoyable one. Tania Johnson, who organised it, had invited scientists who we chatted to in the interval. When and where: Royal Observatory, Blackford Hill, 18:30 – 20:30. Is your keyboard haunted? Don’t worry – an exorcisms is quite simple. A fun night of technology chat saw my lecture on exorcising a haunted keyboard joined by James Stewart’s living laptop and Gavin Inglis’ haunted network. My lady scientist buddy Kaite Welsh told the true story of Victoria Frankenstein’s creation, and Floating Brick Theatre gave us a view of what a future with truly open minds could be like. Not a nice place. 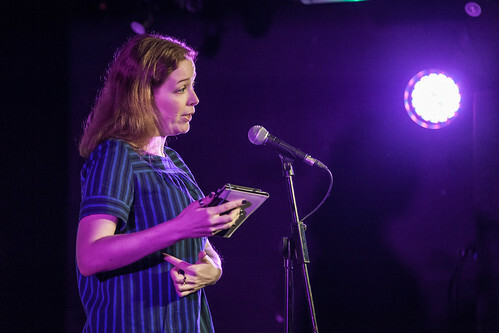 Halsted M Bernard took to the stage twice, once to read poems created from or inspired by her spam folder and to tell a story of how satisfying social media can be. That wasn’t everything. Colin Bramwell told a tale of autism and computer games to ethereal musical accompaniment and Bob Moyler took the shape of Belzebub. His two assistants, also wearing his face, were mesmerizing. The lady scientists ride again! This time, we celebrated Women in Engineering Day at Heriot-Watt University. Emily Dodd, Rebecca Douglas, Jessica Johannesson Gaitán, Jessica Innes, Mhairi Stewart and Kaite Welsh joined me on stage, and Rhi McCrorie looked after sound effects and slide show. We really enjoyed performing again and from the sounds of it, the audience enjoyed it too. Here, I’m doing something I like to call ‘acting’. Jess – sorry, Florence – too is intent on the speaker. 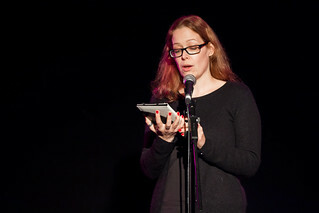 I performed at Illicit Ink’s April Skyground event, The Lady Scientists Stitch and B*tch. I channeled Marie Curie with a tale of the work that goes into Nobel prices and families. The event was part of the Science Festival and took place at the Story Telling Centre, 20:00, 11 April, 2014. The Story Telling Centre is a great venue. I enjoyed being bathed in radium-green light for a section of my story although it was a little scary that I could see the audience quite well. Friends asked me afterwards if black was the default clothing of female writers and I had to tell them that no, I was one of the few in our group that didn’t have a problem knocking up an all-black outfit. We were dressed in the same colour on purpose, not by chance. I really enjoyed not being alone on stage. 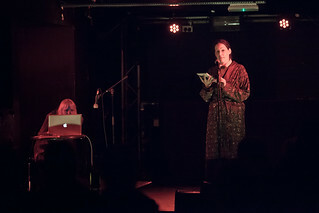 The other writers/performers were Melanie Hugel as Cecilia Payne-Gaposchkin, Mhairi Stewart as Mary Sommerville, Emily Dodd as Emma Darwin, Jessica Johannesson Gaitán as Florence Nightingale, Rachel McCrumb as Ada Lovelace, Ariadne Cass-Maran as our compare the Mad Lady Scientist. Illicit Ink has split into two events and I performed at the Illicit Ink Underground event Body Language March 2, 2014. 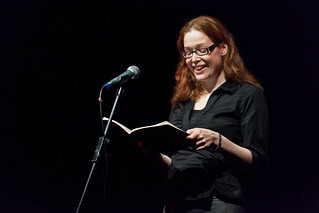 It had been almost a year since I last read and it felt good to get up on stage again. I opened the show with Mouth. Like many of my spoken pieces, it’s a first person account of some weirdness, in this instance, what it’s like when a mouth growth in your side. Lucy Ribchester followed my story with one about a naughty and inventive high wire walker. J. A. Sutherland ended the first section with a elephants and interpretive dance. I really enjoyed the variety to performances. The second section saw readings from Fiona McDonals and Tracey S. Rosenberg as well as a dance piece by Skye Rynolds and Sáras Feijoó. 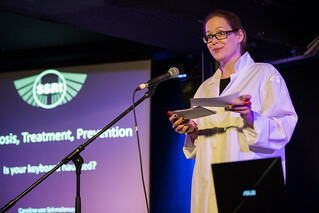 In the last third, Max Scratchmann talked about age, Jo Clifford about everyone’s right to pee in peace and then Nerd Bait spilled blood on the stage. See Chris Scott’s photos from the event. Rhian Thompson on the laptop, me on the mike, as baby Ben fights monsters in the dark. Illicit Ink moved to the Bongo Club‘s new premises on the Cowgate, just before you get to Grassmarket. And what premises. On May 5th, Illicit Ink ran a free event themed on sleep. The organisers asked for something a little different: music, collaborations, outfits. I read Baby Ben is Crying, accompanied by creepy sound effects by Rhian Thompson of Hockyfrilla. Baby Ben tells the truth about sleep, and why we need language. Other performers were: R.A. Martens who made me look at yoghurt in a new way, George Anderson who read Soon Enough in a nightcap, J.A. Sutherland whose dialogue I thoroughly enjoyed, Kirsty Wishart whose sleep-company I kind of wish existed and Andrew C. Ferguson who gave us sound-effects and accents. And that’s not everyone. It was a really good line-up and I look forward to the next event in June. See Chris Scott’s pictures from the event. Thermal vents are fascinating. There are all kinds of things, down deep in the sea, that we haven’t discovered yet. Not all of them will be friendly. We’re hurtling towards Christmas so the theme for the December Illicit Ink event is, obviously, the sea! I read The Corals Wave Back, a heart-warming story of the deep sea and the critters that inhabit it. I think it was well received and I enjoyed reading it, apart from the moment when I lost my place and couldn’t get the Kindle to go to the right page. But it wasn’t all about me and my seven minutes in the spotlight. Helen Jackson, Lynsey May, Kirsty Logan, George Anderson and other talented writers also read their stories. Listen to me, Kirsti Wishart and Gavin Inglis read from our stories to officially launch Birlinn’s anthology The Seven Wonders of Scotland, edited by Gerry Hassan. We’ll describe very different wonders, in very different ways. Come along! It was fun (and we got free wine). The topic was espionage. The story was about cake. Honestly, it seemed like the only logical take on the theme. 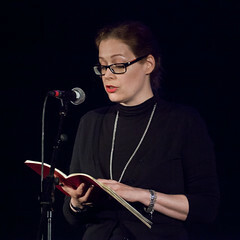 An evening of readings on the theme of espionage organised by the lovely people at Illicit Ink. I read a story called The Victoria Sponge Affair, an exciting tale about industrial espionage in the tea shops of Whitby. The event was compared by STV’s David Marshland and headlined by Alan Bisset. I didn’t fall down the stairs this time either and made sure I wouldn’t by practicing walking up and down them before getting on stage. I find it really helpful to stress about something other than my performance. Saying that, I am getting better at reading in public. I even did a voice, maybe even two, this time. 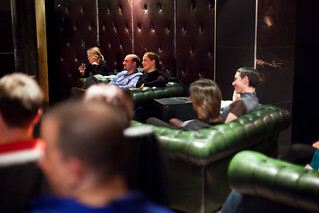 Read a review of the event, or see Chris Scott’s pictures from the evening. When and where: The Bongo Club, Holyrood Road, 20:00 – 22:00. The vegetable patch is the final frontier. An evening of readings that have something to do with space. The working title for my story was Space Carrot. (I love working titles. They get straight to the point.) It’s about a boy who loves rockets. Cabaret Voltaire closed so we moved to the Bongo Club. There was a really good mic – that is, a mic that was easy to work with – and a real stage. I was concerned about falling down the stairs on exit but can announce that I didn’t. Because I was the second person on I had time to relax and enjoy the stories told by the other performance, particularly my writer’s group buddies Gavin Macmenemy and Roushan Martens. Read a review of the event, or see Chris Scott’s pictures from it. As part of Midlothian’s Love Your Library Day I read a couple of stories at Penicuik Library. With me were Helen Jackson and Lynsey May. We had an animal theme so I read the short version of Liz & Bob and Neon Tetra Suicides because they both have animals and they are inspired by the same place. To me, it is interesting to hear what very different stories a location can evoke. We had a small but very friendly audience and enjoyed our hour in the spotlight. 2 October, 2011: Monsters Ink. That night, I didn’t just stand on stage but sat on it too. A night of writers reading their stories. The theme is monsters and monster is the word. I read a story which, in a later incarnation, appeared as The Wolf at the Door on Flashes in the Dark. The story is inspired by when I stayed with friends in Stockholm. I stayed in a bedroom that faced onto a large court yard and had a balcony. The people in the flat above were having a dinner party and I was listening to the voices, wondering what they were talking about and remembering being a kid, listening to adults chatting in the other room. The section of the story I told missed out all of the detail and went straight for the action.